The second building added to the farm museum was a beautiful log cabin donated by Mr. & Mrs. William A. Barker of Southside, WV. The cabin is a fine example of the pioneer homes built during the early 1800's. 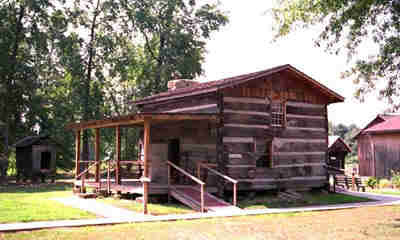 The Allen Log Cabin is a two-story log house built around 1830 by Mr. John Allen and his son William. It was originally located near Procter, WV. It was last occupied in the late 1970's. The cabin was donated by Mr. & Mrs. Lane C. Evans. After being properly marked and disassembled on its original site in Procter, WV, it was transported to the West Virginia State Farm Museum and reassembled in the late 1980's, using the markers previously made. Considerable effort was expended to have the structure retain, as much as possible, its original materials and appearance. The structure was completed in 1994. One of the few changes made to the original design was the addition of handicapped accessible ramps. The museum had previously obtained, through donations, two huge handlooms and a large spinning wheel dating from the first half of the I9th century. These rare and historically important pieces are presently housed in the log house. 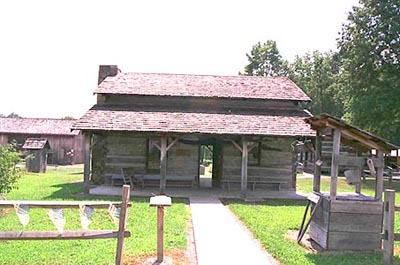 The Allen Cabin houses some of the museums collection of early textile tools. The large spinning wheel is known as a Walking Wheel or Great Wheel. It was used to spin cotton or wool fibers. The yarn skeiner next to the wheel was used to measure the spun thread or yarn. A restored barn frame loom, complete with 300 hand tied string heddles has the beginnings of a wool rag rug. The skarn above the fireplace would have been used to hold the warp yarn for warping the loom. Also one each of the Museums old quilting frame and treadle sewing machine. The wooden furniture on the front porch was handmade by Roy Balser. Mr. & Mrs. Balser donated it to the Farm Museum in memory of their son James William Balser. There is something different to see at every season. 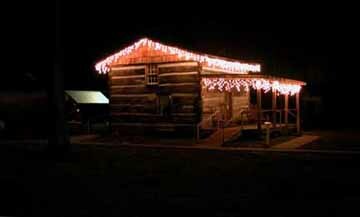 While the log cabins are decorated inside and out with period furnishings, the rules are bent a bit during the Christmas season to decorate them with "modern" electric lights. One of the Museum's biggest attractions is the Christmas Light Tour and the decorated cabins help to make the tour more exciting.